In August 2009, critic Frank Bruni awarded Eleven Madison Park a perfect four stars in the New York Times. The restaurant, which opened in 1998, now ranked “among the most alluring and impressive restaurants" in the city. What brought Bruni “particular joy” was the fact that it had gotten better and better over time. While most restaurateurs were battening down the hatches during the Great Recession, principal owner Danny Meyer continued to make improvements. In April 2010, it was named as one of the "World’s 50 Best Restaurants" on San Pellegrino's annual list compiled by Restaurant Magazine. 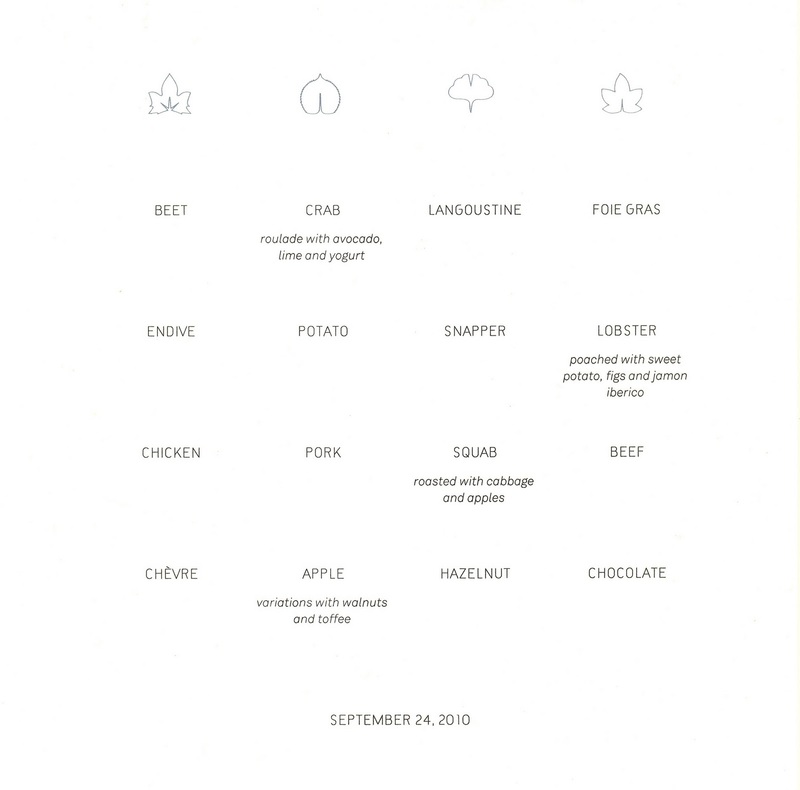 In September of that year, Eleven Madison Park went exclusively to a tasting format. The change was reflected in a minimalist menu which was the antithesis of the text-heavy style that had been popular for so long. 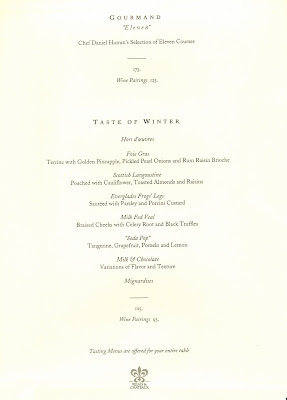 Yet in the warm and inviting context of Eleven Madison Park, the new menu strikes me as a bit austere. Stylistically, the grid is more reminiscent of a word game than a menu. 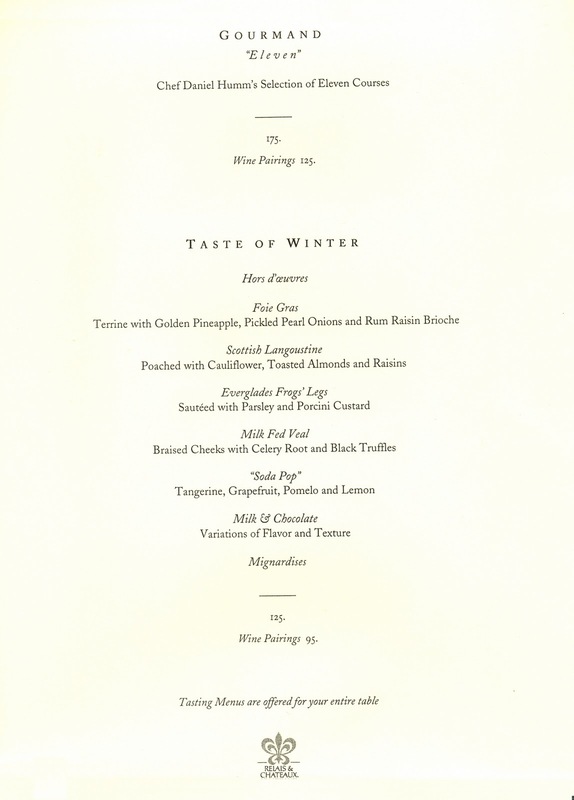 The restaurant's earlier menu, such as the one below from winter 2010, featured a three-course prix fixe ($88) and a six-course tasting ($125). 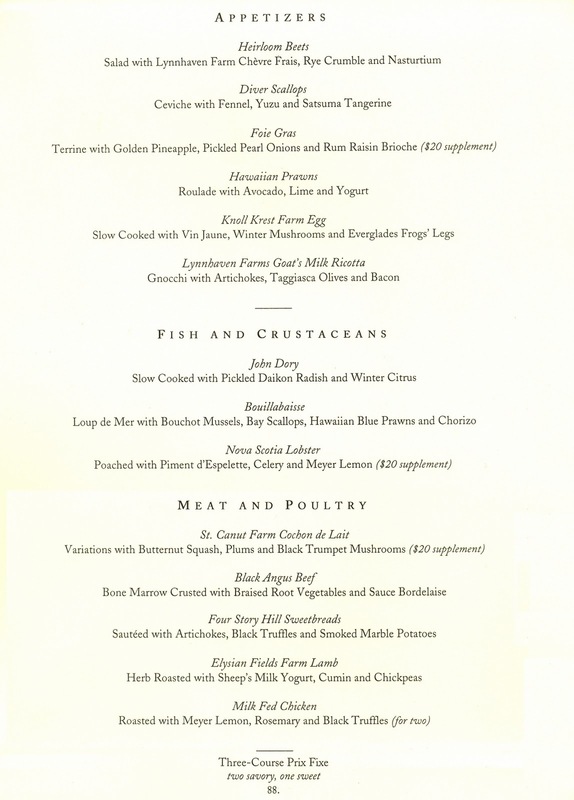 The large menu (9 x 14½ inches) was presented in an expensive, custom-made holder similar to those used at other top-tier places in Manhattan. In the new format, diners may select either a four- or five-course tasting for $125 and $155, respectively. 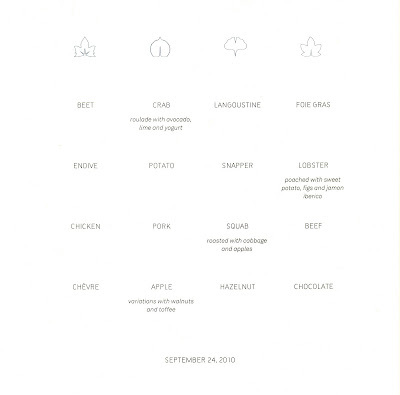 The 8- x 8-inch menu card comprises only sixteen words, one to represent each dish named after its principal ingredient. For example, a four-course tasting might be composed of Crab, Potato, Beef, and Apple. If you prefer the five-course dinner, the diner simply picks another one of the twelve items from anywhere on the card. The concept is intended to provide diners with “the inherent surprise of a tasting menu, while still maintaining some control.” The process is geared more toward having a dialogue with your captain than reading the menu. The new design is no exception to the axiom that menus with less verbiage offer more choices. In fact, the four-course option offers 256 different combinations; 1,536 if you order five courses. That’s a lot of choices for a tasting menu which is usually set in stone. 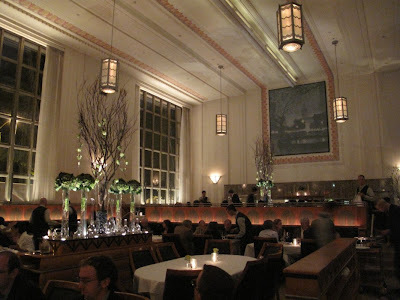 And that does not include the numerous amuse-bouches, the bite-sized morsels that rank as one of the highlights of dining at Eleven Madison Park. When people began to ignore the entrees and make meals out of appetizers, restaurants such as Charlie Trotter in Chicago and the French Laundry in Napa Valley adopted multi-course tastings. Over the last few years, such menus have again become increasingly popular. 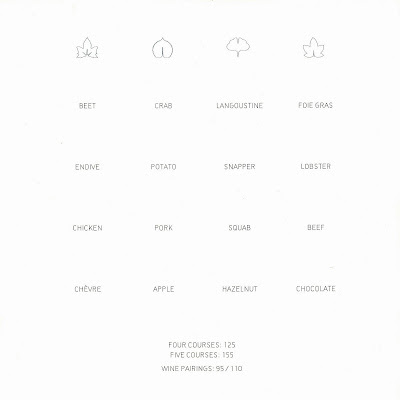 Nor is Eleven Madison Park the only restaurant to use the names of the primary ingredients to describe a tasting. 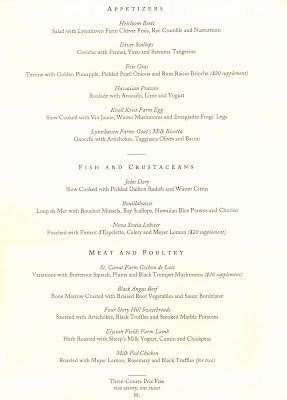 In lieu of a menu, Blue Hill at Stone Barns in Pocantico Hills, New York provides its diners with a list of over a hundred ingredients which is basically the list of foods used in preparing “farmer’s feast” tasting. Indeed, the basic concept of the two restaurants is very different. Blue Hill at Stone Barns is about sourcing from local farms; ingredients such as Berkshire pigs and Cornish Cross chickens are specifically identified as a part its locavore philosophy. 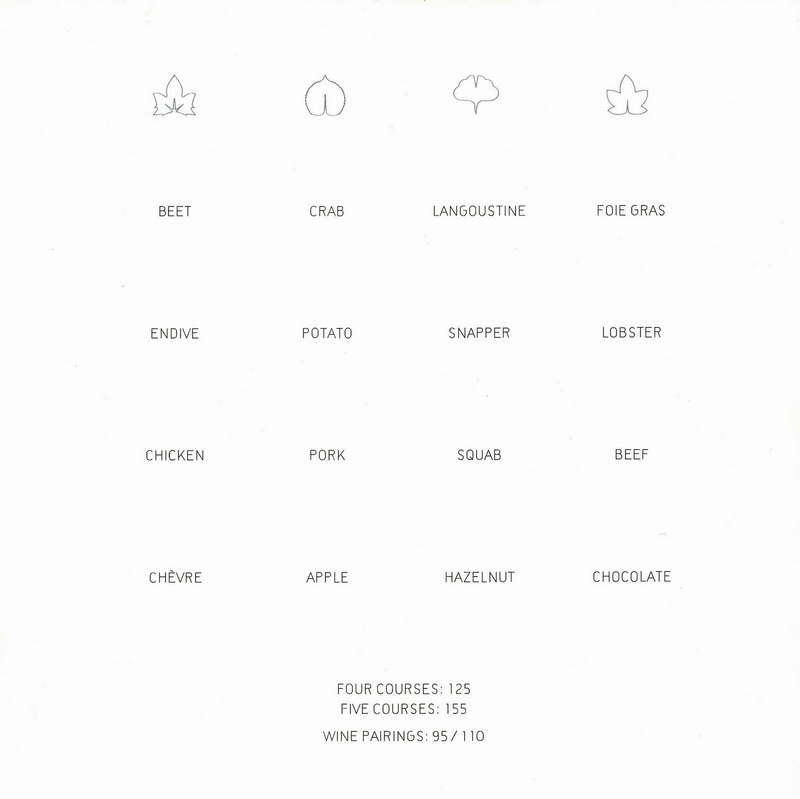 At Eleven Madison Park, the simplicity of language is deceptive. Generic terms like “Pork” and “Chicken” are used to represent highly complex dishes that defy description. There are pros and cons to the new approach. On the positive side, the diner is spared the tedious descriptions of the origin and pedigree of the meal’s components. Nevertheless, the literary creativity is missing, forgoing the playful affectation that is usually part of the game at the high end. 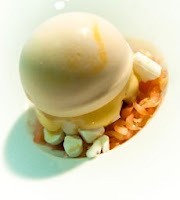 The new menu is affected but not amusing, such as the allusion to an everyday food that is expressed in dishes like Le Bernardin’s “Surf and Turf” and Per Se’s “Snickers Bar.” In fact, the old menu at Eleven Madison Park featured “Soda Pop,” a dessert which consists of a sphere of tangerine foam which has been frozen with liquid nitrogen and placed atop pomelo pulp, grapefruit and blood orange dice, crumbled lemon meringue, and Pop Rocks, causing it to pop when you bite it. Blood orange cream serves as the base. The dish may still be served there, since the cuisine itself hasn’t changed. However, which would you rather think about, talk about, and marvel over when it arrived—Soda Pop or Tangerine? If you request a menu as a souvenir, you are in for a little surprise. Each person at the table is presented with a menu that has been transformed into a personal memento. The prices are removed and replaced with the date and a brief description of the particular dishes that you ordered. The keepsake is cleverly enhanced, providing the information you will want to remember, without the prices you would like to forget. wow! fascinating cultural commentary! what a great surprise! the american menu is truly a topic worth a lifetime of exploration. Just fascinating. I've just subscribed to your blog -- love it! (I'm adding you to my blogroll too. )And please tell Julie I am blown away by the quality and creativity of the art projects on her site. Lucky, lucky children who get to do that in school! "Soda Pop” or Tangerine? There's the rub. To story tell or not to story tell. A fascinating topic to debate for sure. "tedious descriptions regarding the origin and pedigree of the meal’s components". This is interesting too because in France, these are valued descriptions. But they are region based (AOCs) and not the producer, which would be tedious on a menu indeed. The most amazing menu in this style that I've seen so far is Alinéa. Mind blown with that one when know the explanation. This site is fabulous, I have always enjoyed menus and regret losing many that I've kept over the year. But I am at the Kindergarden level of menu-keep compared to you. I am often relutctant to hand over my menu when I order and opt to keep it by table side until the first item comes. I get weird looks. I might have a menu fetish. I love menus that describe the food, the source if possible and are enjoyable to read, but I get a little anoyed if they go too far into the culinary thesaurus, for the sake of trying to sound sophisticated.